Seven passengers on a trip to Manila escape death and their respective "sundo" by a twist of fate. Soon, they realize that the price they have to pay for gambling with the spirit of tragedy is the hardest and most ruthless battle they will ever come to face. 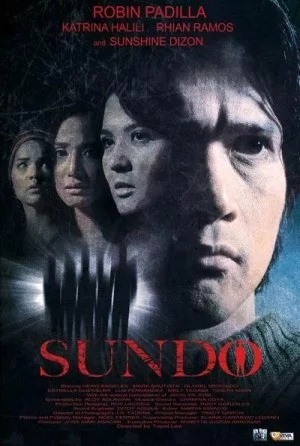 Sundo is a 2009 Filipino suspense-thriller film from director Topel Lee, with screenplay written by his Ouija screenwriter Aloy Adlawan. The film stars Robin Padilla, Katrina Halili, Rhian Ramos, Hero Angeles, Mark Bautista and Sunshine Dizon. The film was released on March 18, 2009.